Laptops, smartphones, tablets and web-based apps let groups collaborate from virtually anywhere around the globe. But in-person collaboration has largely remained tech-resistant. Until now, that is. Say goodbye to disengaged team members who zone out when asked to stare at non-interactive presentation tools. 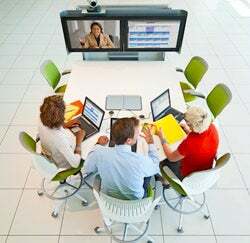 A growing number of collaborative display devices are being designed to help promote teamwork and more productive meetings. 1. Build an interactive environment. For some entrepreneurs, the traditional conference room setup of a big table and projector is no longer the best way to manage a team of employees and their mobile devices. Another option is to create a collaborative environment that lets you work more comfortably and conveniently from a variety of locations. For screen sharing, consider using a large display that everyone can see clearly and that can be easily connected to a variety of devices. Grand Rapids, Mich.-based Steelcase specializes in tech and team-friendly office arrangements. The company's collaborative table and teleconferencing tool called media:scape lets up to four users plug in and share their own device screens -- and audio -- on a central display simply by pushing a button. In addition to the full-size conference style version, Steelcase comes in mini and mobile versions. Prices vary by configuration. Large format touchscreens can be useful collaboration tools for side-by-side computer work. Touch displays, including the Multi-Touch Display from St. Paul, Minn.-based 3M, can turn any computer session into a shareable iPad-like experience. 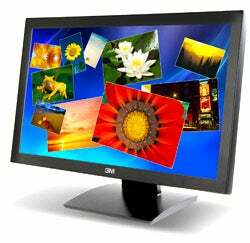 Touch-enabled monitors such as the 18.5-inch 3M Multi-Touch Display (about $1,175) allow multiple users to manipulate content on the screen without surrendering the mouse or keyboard. While it's probably not practical for two or more people to work on one screen all the time, touch functions can be useful for graphic designers and other creative workers when they're brainstorming on the same document. 3. Try an interactive white board. Interactive whiteboards from companies such as Calgary, Canada-based SMART are similar to touch-based monitors, but large enough to allow groups to collaborate on digital content, including web pages and PDF files. These tools take the traditional white board up several notches. Groups can write directly on the display -- mark up documents, make highlights or take notes -- and the smart board will capture the changes. 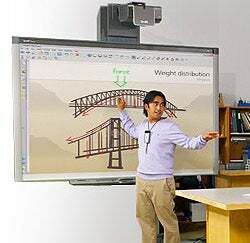 Basic interactive whiteboards from SMART start at about $1,000. 4. Turn your conference table into a computer. 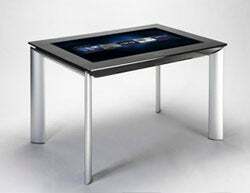 Technology companies have transformed staid conference room tables into "smart" tables that can act as giant tablet computers. Simply pull up documents, images and other content directly to the table's screen, and people can manipulate the items with their hands. Take for instance the Samsung SUR40, developed in collaboration with Microsoft. This device was designed as a customer engagement and marketing tool, but it also has potential as a next-generation collaboration platform. While smart conference tables can be useful for group review of content or face-to-face presentations in small groups, they aren't inexpensive. The Samsung SUR40 retails for about $9,000. Bottom line: For businesses looking to fundamentally change the way they collaborate, these tools now make that possible. If any of them can turn just one good idea into a great one, the benefits can more than offset the initial cost.